The only Asturian dish that I had known before coming was the Fabada Asturiana, a stew of large white beans and meat. It’s found in restaurants around Spain, and the ingredients can be bought pre-packed, although I can’t say that I’d tried it before. After coming to Asturias, I’ve noticed Fabada Asturiana on many menus, especially tourist-oriented ones (I count myself as one who wanted to have the dish at its source! ), but the other dish that I kept seeing over and over again was cachopo. Cachopo, as I found out, is kind of like a pork tonkatsu but with cheese and other ingredients. And what is interesting is that those ingredients can be mixed up, something that shocks me coming form Valencia where people define paella in one and only one way (and apply the same rigidity to other dishes like gazpacho even when Andaluces aren’t even so strict). I like that element of creativity and innovation in cuisine! So I did some research and according to a contest, “the best” cachopo can be found in a restaurant in Oviedo, Sidrería Pichote. I walked about 25 minutes out of the center of town through residential areas, to find a place not shy about broadcasting their championship win! And it turns out that the adjacent restaurant El Café de la Tierra shares the waitstaff and kitchen and menu. The only difference I found was that on the Sidrería side, the waiters pour the sidra, or cider, the traditional way by extending one arm with the cup as low as they can and the other arm with the bottle of cider as high as they can, to aerate the cider to the greatest extent possible, it requires some good aim! On the Café side, however, the same waiters provide this automatic aerator. I guess what it lacks in spectacle is made up in convenience, because you are supposed to pour only a gulp at a time. So when the waiter pours for you, you have to wait for him to come around whenever you want a drink. The 2018 winner, which did win both Asturia region and Spain awards, has a stronger Asturian cheese mixed in, the gochu asturcelta, the other cheese made with cream and the same frixuelo, and boletus mushrooms. Soon enough, this ENORMOUS slice of tree came out, spanning from one side of my table to the other! 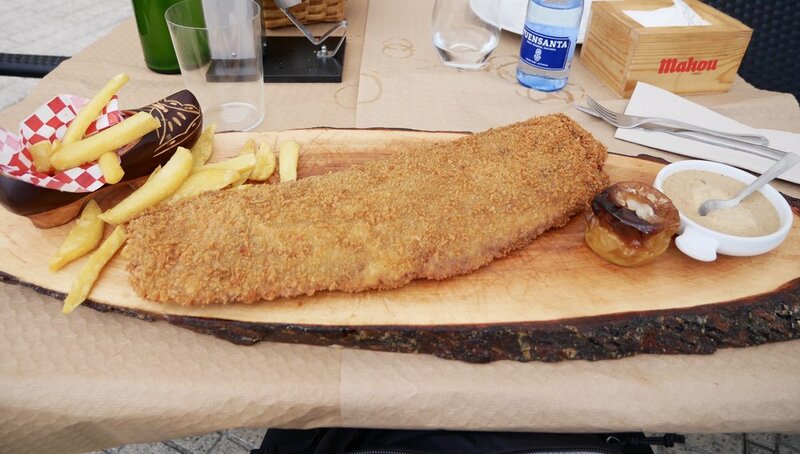 And the cachopo itself seemed to be over a foot long. It was served with fries (in a clog?! ), a baked apple, and some creamy mushroom sauce. Here is a fork for scale! After ordering, I overheard a waitress at a different table mention that one person could order a “cachopín,” or half-size cachopo, because the regular one does feed two. Too late! So how did it taste? Well they did do an excellent job frying to a crisp, and the copious melty cheese helped to make the inside quite moist. The boletus were a nice touch, but I’m not sure what that crepe is doing in there! 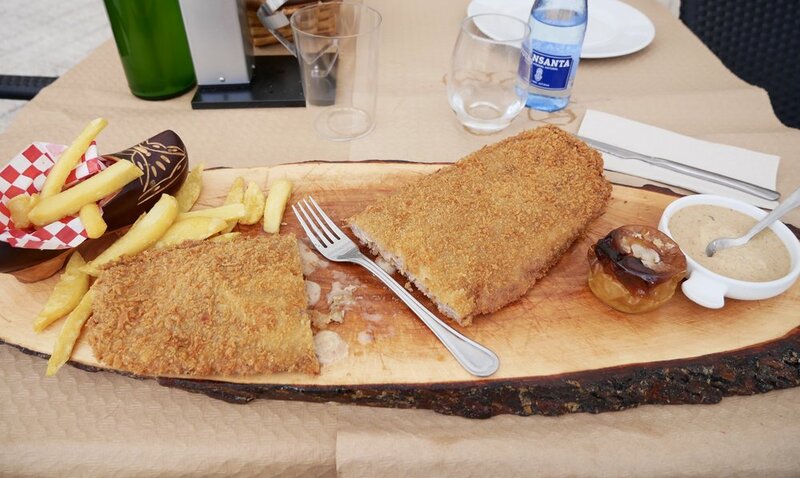 Next time someone laughs at how Americans overindulge and fry up huge portions of food at state fairs, I’ll point them to the cachopo in Asturias! It is a very satisfying meal, best to be shared, and I would recommend the Sidrería Pichote 2018 version. I did come across some tourists eating one on a terrace in Avilés, and it appears more dry and insipid. So they are not all created equal - and that’s a good thing for creativity in the kitchen!